Facebook has made no bones about wanting to blanket the planet with Internet connectivity, and it’s developed a huge, solar-powered aircraft to help it do so. The unmanned aircraft, called Aquila, has the wingspan of a Boeing 737, but weighs “about the third of a [Toyota] Prius car,” said Facebook vice president of infrastructure engineering Jay Parikh Thursday during a media event at Facebook’s campus in Menlo Park. Aquila will be responsible for beaming Internet signals back to rural areas on Earth that lack the kind of communications infrastructure needed to maintain Internet connectivity. According to Parikh, 10% of the world’s population live in these rural areas—found in certain regions in Africa and India, among others—and are unable to access the web. A small team of Facebook engineers in the U.K. spent 14 months building the plane. Facebook wouldn’t say how many employees were involved in the project. Aquila’s wings are made of a type of material called carbon fiber. When the carbon fiber material undergoes a kind of heating process known as curing, it can become “stronger than steel for the same mass of material,” explained Facebook Connectivity Lab director Yael Maguire in a blog post. This material also accounts for why the drone is so light. 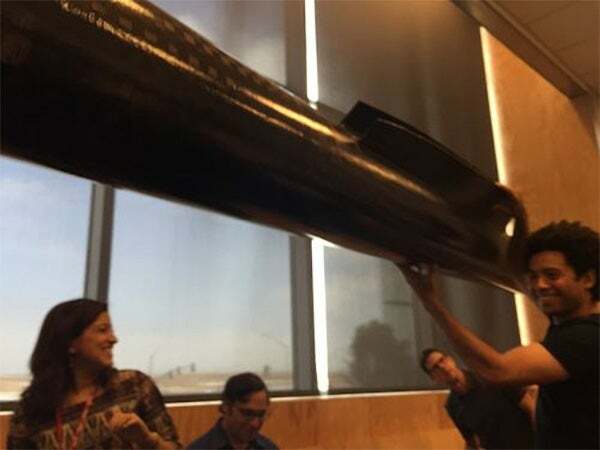 Facebook Connectivity Lab director Yael Maguire shows reporters a very light carbon fiber pod that’s part of the drone. It will house the drone’s batteries and motors. Facebook plans to launch the plane into the sky with the help of a big balloon that will carry the aircraft to the stratosphere. There it will hover between altitudes at around 60,000 to 90,000 feet. At these altitudes, the aircraft will be far above the airspace where commercial airliners fly and free from storms or other weather disturbances, Parikh explained. The Facebook team also covered Aquila with solar panels and fitted the craft with batteries and an electric motor so the plane can stay up in the sky for 3 months. Over that time the drone will beam the Internet down without interruptions or a need for refueling. And when the plane does come back to the planet, Maguire told reporters that it “will land like a glider” because of its aerodynamic design. While in the air, Aquila will be responsible for providing the Internet to people on Earth in a 50-kilometer radius. Small cellular towers and dishes will receive the signals sent by the aircraft and will convert those signals “into a Wi-Fi or LTE network that people can connect to with their cellphones and smartphones.” Maguire wrote in the post. Facebook said it also achieved a breakthrough for the way data and information can be transferred from drone to drone. If Facebook flies multiple planes it could be able to cover much larger swaths of land. Using laser communication technology, Facebook supposedly created a way to stream data between drones at a rate of ten gigabits per second, a speed that’s as fast as what fiber-optic services can provide to U.S. residents, such as those living in Minneapolis. The breakthrough in laser communications is a result of the software-based networking advancements Facebook has been rolling out in its data centers, Parikh explained. Communication signals sent through the sky are so accurate, they can apparently “hit a dime from 11 miles a way,” said Maguire. The accuracy is important if drones are to be able to send signals to and from each other, which would result in less Internet infrastructure needed to be built on the ground. “This starts to look like a backbone of the Internet using lasers in the sky,” said Maguire. Facebook’s Yael Maguire explains how multiple drones could create an Internet backbone in the sky. Of course, it’s important to remember that Facebook is not close to launching these planes to power the Internet just yet. Facebook has only built one drone so far, with plans for more coming down the pipeline. As of now, “the plan is to spend the second half of this year doing flight testing,” Parikh said. Parikh also pushed back on a question implying that Facebook might only allow the Facebook website or certain websites to be sent to rural areas through its ambitious project. He said Facebook has no plans to become an Internet service provider. Instead, the goal is for Facebook to set up the aerial Internet infrastructure, and then let major carriers operate and distribute the web in a similar manner to how they do so on Earth, Parikh said. 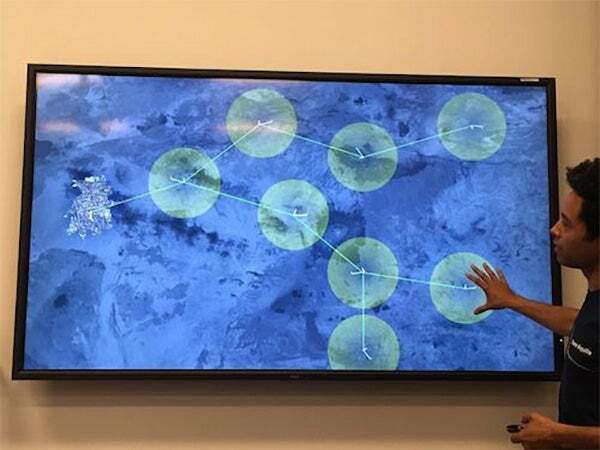 The drone project was developed by Facebook’s Connectivity Lab, which contains former researchers from NASA’s Jet Propulsion Laboratory and the National Optical Astronomy Observatory, among others. The lab is part of Facebook’s Internet.org initiative to bring the Internet to places where there is a lack of connectivity. Major players involved in the telecommunications industry have signed on as partners of the Internet.org initiative, including Ericsson, Samsung, and Qualcomm.